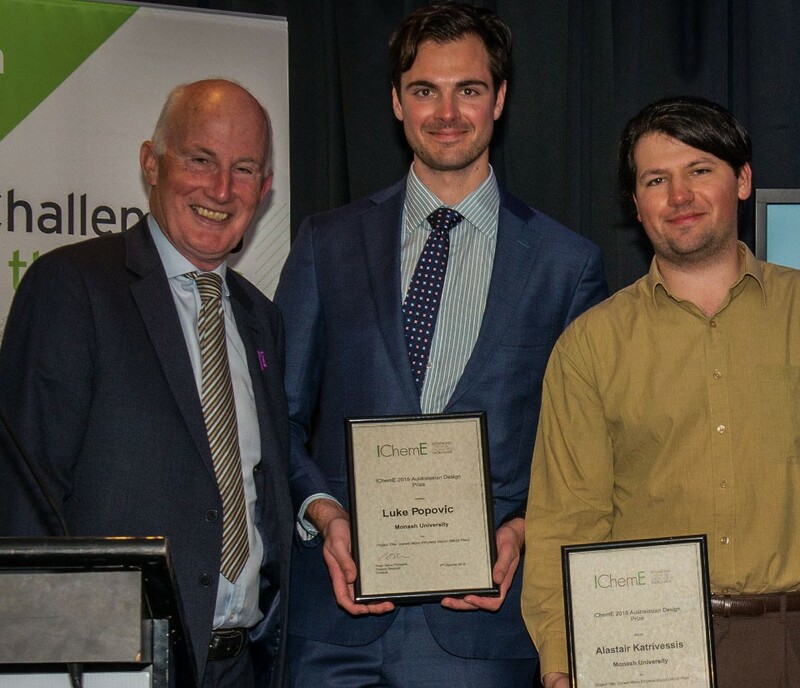 Wood engineers in the Australian Graduate Engineer program, Luke Popovic and Alastair Katrivessis were recently recognised by the Institution of Chemical Engineers (IChemE) for their outstanding contribution to their final year project run by Monash University, Melbourne. The engineers were part of a team awarded the Australasian Design Prize for their final year project, Darwin MEG Plant. They were commended for a well-researched project, especially in the areas of environmental impact and risk assessment. They were also recognised for their teamwork in maintaining good records and datasheets, an essential skill in the industry. Can you describe what your final year design project was and what the motivation was behind the project? Our final year project was a feasibility study on the production of monoethylene glycol (MEG) in Darwin, Australia. MEG is a raw material used in the production of several polyesters including those used in clothing and to produce polyethylene terephthalate (aka PET, the plastic used commonly in soft drink bottles, etc). The demand for polyesters is expected to grow considerably by 2020, and so the study was to evaluate whether a hypothetical processing plant in Darwin was viable. This issue of MEG production is topical as a significant portion of Australia's waste (approx. 30%) is currently shipped to China for recycling and reprocessing and if China was to tighten their regulations on accepting foreign waste Australia would need to either increase its MEG and PET production and/or increase its recycling capacity. Therefore, our project looked at the feasibility of increasing the MEG production in Australia through the development of facility located in Darwin. The topic was assigned to all final year (2017) Chemical Engineering groups at Monash University, with each group being randomly assigned a location and chemical process. Can you describe the project team and your roles? Luke: There were six members of the team which were randomly allocated based on personality type. I was assigned the team leader and Alastair was assigned as the technical expert based on personality testing undertaken by all students prior to the commencement of the course. These were two key roles in the group. Alastair and I were involved heavily in the plant design and modelling as well as the safety and environmental assessment of the facility. These sections of the report were mentioned specifically in the judging of the prize, so we were very happy with the acknowledgment. How long have you worked at Wood and what are your roles? Luke: I commenced work at Wood in January 2018 in the graduate program. I work in the Melbourne office as a graduate process engineer. Alastair: I commenced work at Wood in March 2018 in the graduate program. I work in the Perth office as a graduate process engineer. I moved to Perth from Melbourne, which has been a fantastic opportunity and a great learning experience that has helped me grow both personally and professionally. What attracted you to a career in engineering and Wood? Luke: Chemical engineering was a natural fit for me as I always had an interest in maths and chemistry and loved understanding how things worked. I was attracted to a career at Wood due to the emphasis placed in training graduates with a combination of practical site-based work and technical design experience. Alastair: Excelling in team projects, including the design project, gave me confidence to pursue a career in an interdisciplinary engineering firm. Wood stood out due to its emphasis on providing technical solutions throughout its diverse global portfolio of projects in conjunction with their nurturing work culture that helps provide numerous development opportunities. What does this award win mean to you? Luke: It was a learning experience to lead a team and I am honoured to have had the incredible opportunity to meet industry leaders at the 2018 Chemeca Conference in New Zealand. I see this achievement as a great stepping stone for me into my career at Wood, where I hope to continue to learn best practices from my colleagues and further develop my passion for process design. Alastair: The award validates my passion to progress with Wood in contributing world-class designs for implementation, which maximise process safety and sustainability. Additionally, the award also provided me the privilege to meet the influential leaders in the IChemE community of which I aspire to be part of.